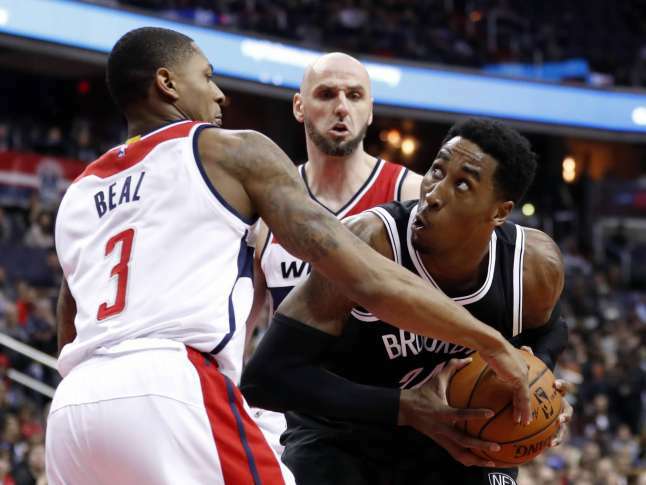 The Wizards ended their two-game homestand with a 129-108 win over last-place Brooklyn. “Just because we clinched, still not satisfied,” Washington’s Brandon Jennings, who was playing against his former team, said. WASHINGTON — The Wizards return to the playoffs, after missing out of postseason play last year. The Wizards ended their two-game homestand with a 129-108 win over last-place Brooklyn as Washington’s Brandon Jennings, who was playing against his former team said, “Just because we clinched, still not satisfied,” as the team would like to improve their postseason position. But the Wiz still have a five-game road trip starting tonight in Cleveland, the conferences’ top team and defending NBA Champions. The Wizards are just 15-18 on the road this season, playing the final eight of their last ten games away from Verizon Center, so at best, the team will try to stay as the No. 3 seed in the East, assuring themselves of home court advantage in the opening round of the upcoming playoffs. Jennings, who had 18 points, was one of three bench players to score in double-figures as the third-place Wizards moved a game ahead of idle Toronto in the Eastern Conference. Bojan Bogdanovic was another off the bench, and he scored 17 points against his former team — he and Jennings were with Brooklyn to start the season before coming to Washington before the trade deadline. Ian Mahinmi also had double digit points off the bench as he scored 16 in the victory. John Wall scored 22 points despite dealing with migraine headache symptoms earlier in the day. Bradley Beal added 19 points. Wall and Jennings each had nine assists as Washington won its second straight before embarking on the five-game road trip. Washington’s second unit outscored Brooklyn’s 33-14 in a first-half onslaught, helping coach Scott Brooks give some rest to his starters before tonight’s game at Cleveland. Wall and Beal each played 24 minutes, with Wall seeing fewer than 30 minutes of action in a game for just the third time this season. Neither played in the fourth quarter. Washington trailed 13-4 early before outscoring Brooklyn 55-18 over a 15-minute stretch of the first and second quarters. The Wizards led 63-42 at halftime and by at least 14 throughout the second half.